Background: Drepanocytosis is a genetic blood disorder characterized by red blood cells that assume an abnormal, rigid, sickle shape. 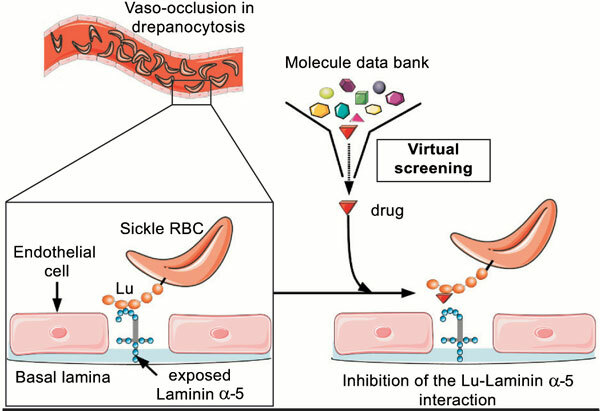 In the pathogenesis of vaso-occlusive crises of sickle cell disease, red blood cells bind to the endothelium and promote vaso-occlusion. At the surface of these sickle red blood cells, the overexpressed protein Lutheran strongly interacts with the Laminin 511/521. The aim of this study is to identify a PPI inhibitor with a high probability of binding to Lutheran for the inhibition of the Lutheran-Laminin 511/521 interaction. Methods: A virtual screening was performed with 395 601 compounds that target Lutheran. Prior validation of a robust docking and scoring protocol was considered on the protein CD80 because this protein has a binding site with similar topological and physico-chemical characteristics and it also has a series of ligands with known affinity constants. This protocol consisted of multiple filtering steps based on docked scores, molecular dynamics simulations, post-screening scores, and molecular properties. Results: A robust docking and scoring protocol was validated on the protein CD80 with the docking program DOCK6 and the secondary scoring function XSCORE. We identified four molecules for Lutheran that have good structural and physico-chemical properties. Conclusion: We took advantage of the similarities between the binding site of Lutheran and that of the protein CD80 to set up a robust docking and scoring protocol. Our protocol for primary scoring filtering, molecular dynamics simulation filtering, secondary scoring filtering, and molecular property filtering allows discarding most of the ligands with four compounds that are promising candidates for inhibiting the Lutheran-Laminin 511/521 interaction. Drepanocytosis, Lutheran protein, protein-protein interaction, molecular docking, molecular dynamics simulations, scoring function.